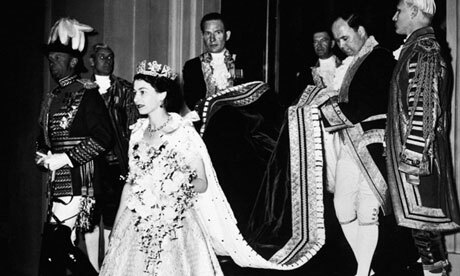 2013 marks the 60th anniversary of the coronation of Queen Elizabeth II. She is only the second monarch to have celebrated 60 years on the English throne. Queen Victoria reigned for 64 years, from 1837 to 1901. 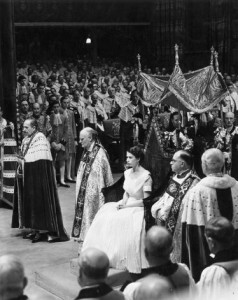 In this post I will describe the various parts of the 1953 coronation ceremony of Queen Elizabeth II that took place in Westminster Abbey on June 2, 1953. 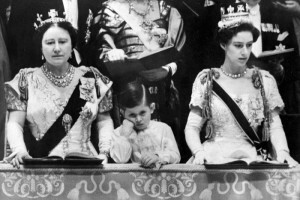 Upon the death of King George VI on February 6, 1953, his daughter, Elizabeth ascended to the throne and be proclaimed queen by the Privy Council. The formal coronation ceremony was not held until one year later since the festivities would be deemed inappropriate during the period of mourning that follows the death of the monarch. The coronation ceremony of Queen Elizabeth II was held more than a year after her accession. In April 1952 the coronation committee, under the chairmanship of Prince Phillip the Duke of Edinburgh was formed to plan the coronation ceremony. 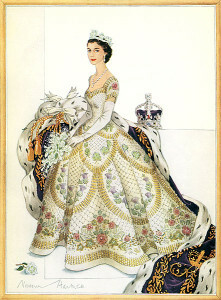 The coronation was scheduled to take place on June 2, 1953 which would allow for 16 months of preparation time. Westminster Abbey was closed for several months while construction crews prepared the exterior and interior. Viewing stands were also built along the route from Buckingham Palace to the Abbey. Sadly just a few weeks before the coronation day Queen Mary, the grandmother of Queen Elizabeth, died on March 24, 1953. Normally, there would be a long mourning period and the coronation would have been postponed for several months but according to the wishes expressed in the dowager Queen’s will she stated that her death should not affect the planned coronation and the event should precede as scheduled. 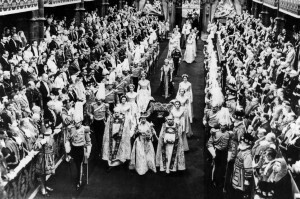 Rehearsals involving all participants were held in the days prior to the coronation date. 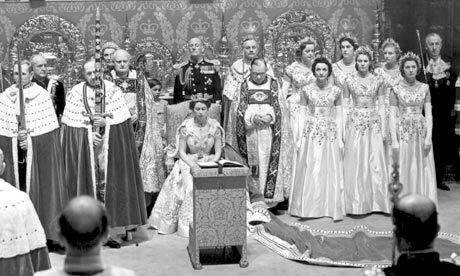 Key members that would participate in the coronation rehearsed the different parts of the ceremony and the Queen took part in two full dress rehearsals just days before the coronation date. She had practiced the procession back at the palace with her maids of honor carrying a long sheet instead of the coronation robe that was being specially made for the occasion. The Queen also wore the Imperial State Crown during the days leading up to the event so that she could get used to the heavy weight of the crown. On coronation day in 1953 approximately three million people gathered on the streets of London. Journalists came from around the world to report on the festivities leading up to the coronation and for the first time in history the BBC was going to broadcast the coronation ceremony to more than twenty million viewers around the world. There had been considerable debate within the British Cabinet and Prime Minister Winston Churchill was opposed to the idea but Queen Elizabeth insisted that the event should be filmed for television. The coronation ceremony for the monarch of England has taken place in Westminster Abbey since William I was crowned in 1066. At the time of his coronation centuries ago there was an older smaller church on the present site in the City of Westminster (London) prior to the building of the current large gothic cathedral. Most people will recognize Westminster Abbey as the place where Prince William married Catherine Middleton in April 2011. Prior to the arrival of the Queen, various foreign royalty and heads of state arrived in a procession of carriages and one of the last to arrive to the Abbey was the Irish State Coach carrying the Queen Mother. Queen Elizabeth and Prince Phillip traveled in grand style from Buckingham Palace to Westminster Abbey in the Gold State Coach pulled by eight matching horses. 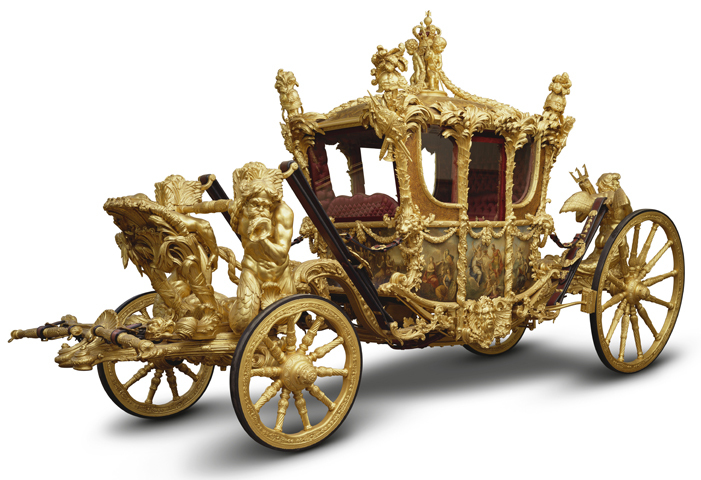 The Gold State Coach was built in 1762 and has been used in every coronation since King George IV; it is also used for other grand occasions such as most recently the royal wedding of Prince William and Catherine Middleton and the Diamond Jubilee. The coach weighs four tons and is 24 feet long and 12 feet high. The gold gilded enclosed coach features panels painted by Giovanni Cipriani and at the four corners are tritons that represent Britain’s imperial power and on the roof are three gilded cherubs that represent England, Ireland and Scotland. The interior of the coach is lined with velvet and satin. The coronation ceremony for Queen Elizabeth II was performed by the Archbishop of Canterbury, who is the most senior cleric in the Church of England. Other clergy and peer members had additional roles and most of the participants are required to wear ceremonial robes or uniforms. Government officials and representatives from foreign countries along with members of the royal family and invited guests throughout England and the Commonwealth nations, approximately 8,000 guests were invited. Finally with everyone assembled the coronation ceremony starts with the procession of the royal regalia. Preceding the Queen into the Abbey are the royal maces, three ceremonial swords representing mercy, spiritual and temporal justice, the Sword of State, St. Edward’s Staff and lastly St. Edward’s Crown. Normally the Sovereign enters wearing a traditional crimson surcoat, this is usually worn for the duration of the ceremony and the other coronation garments and robes are placed over it. 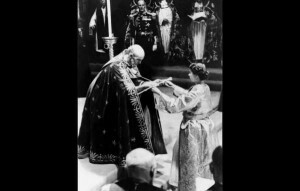 Instead of a surcoat Queen Elizabeth entered the Abbey wearing her custom designed coronation gown made by Norman Hartnell and the Robe of State carried by her eight Maids of Honor. The different sections of the coronation ceremony have largely remained unchanged over the centuries. 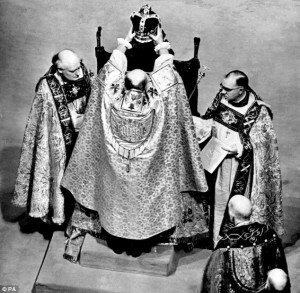 After the procession, Queen Elizabeth arrives at the front of the Abbey, she kneels to pray and then sits in the Chair of Estate as the royal regalia is brought forward and placed on the altar. 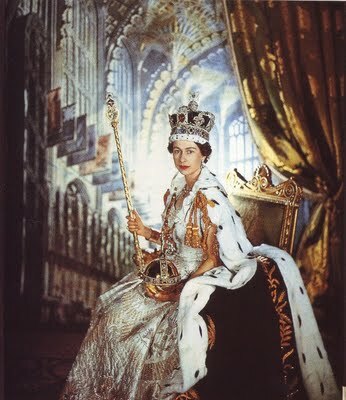 Then she moves to stand before King Edward’s Chair which is also known as the Coronation Chair. 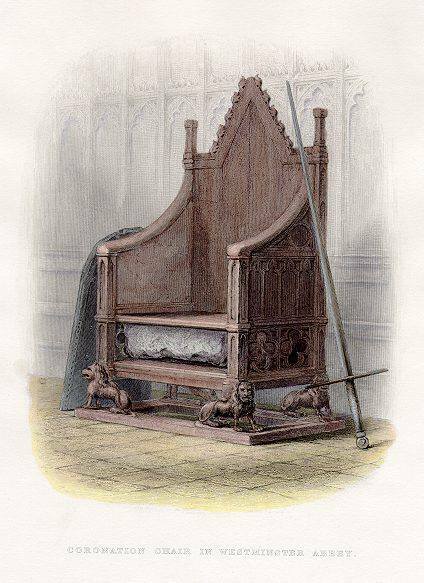 The Coronation Chair was commissioned in 1296 for the coronation of King Edward I to hold the coronations stone of Scotland, also known as the Stone of Scone. The high back Gothic chair was carved in 1297 from oak which features four gilded lions that are the legs of the chair. Since 1308 all England sovereigns until 1603 and Great Britain thereafter have used the chair at their coronations, with the exception of Queen Mary I who was crowned in a chair given to her by the Pope and Mary II who was crowned in copy of the chair. In 1996 the Stone of Scone was returned to Scotland with the provision that it would be returned to the chair for the next coronation. During this section of the ceremony, the Archbishop along with the other clergy presents the Queen to the four corners of the coronation theatre, starting at the east, south, west and north. The congregation signifies their acknowledgement and shouts their joy. The Queen accepts their acclamations while standing in front of the Coronation Chair. The Queen returns to the Chair of Estate and the Archbishop stands before her to ask her if she is prepared to take the Oath. Then, the Queen approaches the altar with the Sword of State being carried before her and with her right hand on the Bible she pledges to uphold the laws of the State and Church of England. Afterwards she kisses the Bible and signs the Oath. The service continues with a reading from the Gospel by one of the Bishops followed by several hymns sung by the choir and the Archbishop will recite more prayers. The Queen rises and with the assistance of the Mistress of Robes she is dressed in an anointing gown made of plain white cloth that fastens in the back and is specially made to be worn over her coronation gown. The Queen once again moves to the Coronation Chair and four Knights of the Garter approach with a pall (canopy) made of silk to shield the public from this most sacred part of the coronation ceremony. The Dean of Westminster takes the Ampulla and the Coronation Spoon from the Altar and with the Archbishop goes to stand before the Queen. The Dean pours the Holy Oil into the Spoon and the Archbishop anoints the hands, breast and head of the Queen. She then kneels and the Archbishop gives her a blessing. The Knights of the Garter remove the pall and walk away. The Queen rises at with the aid of the Mistress of Robes she removes the anointing gown and replaces it with afresh clean tunic, known as the Colobium Sindonis. The Supertunica is put on and fastened with a Girdle and the Stole is draped over her shoulders and finally the Imperial Mantel. The Queen then returns to sit in the Coronation Chair. 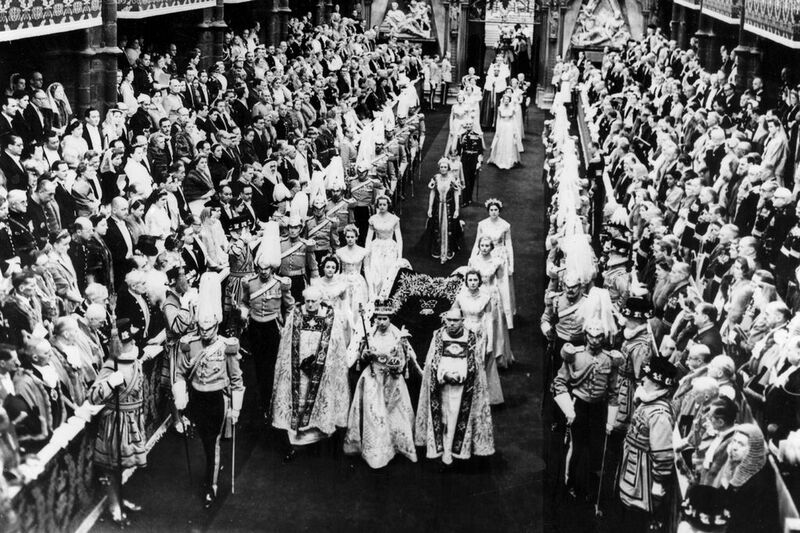 This is the portion of the coronation ceremony when more items of the royal regalia are presented to the Queen, such as the Spurs, the Sword of State, the Armills and the Orb. The Coronation Ring is also presented and placed on the fourth finger of the Queen’s right hand. Next the Sceptre with the Cross and the Rod with the Dove are given to the Queen. Finally this is the part of the ceremony that is the most solemn. The Archbishop stands before the Altar and takes St. Edward’s Crown into his hands and says a prayer. He returns to the Queen sitting in the Coronation Chair and reverently raises the Crown over her head for a few moments and then slowly lowers it onto the Queen’s head. This act constitutes the actual crowning of the Sovereign who symbolically takes possession of the kingdom. As the Queen is being crowned, simultaneously the Princes, Princesses and Peers put on their crowns and coronets and a shout goes out among those gathered in the Abbey, “God Save the Queen”. The Sceptre with the Cross and the Rod with the Dove are given to a peer to hold for the duration of the Homage. The first to pay homage to the Queen are the Archbishop and the other bishops who kneel before the Queen and pledge their support. Then the Duke of Edinburgh pays his homage, pledges his support and kisses the Queen’s left cheek. Next follow the other royal members and peers who have gathered to witness the coronation ceremony. Just before Communion, the Queen will have the Crown removed and the Orb will be given to a peer to hold. 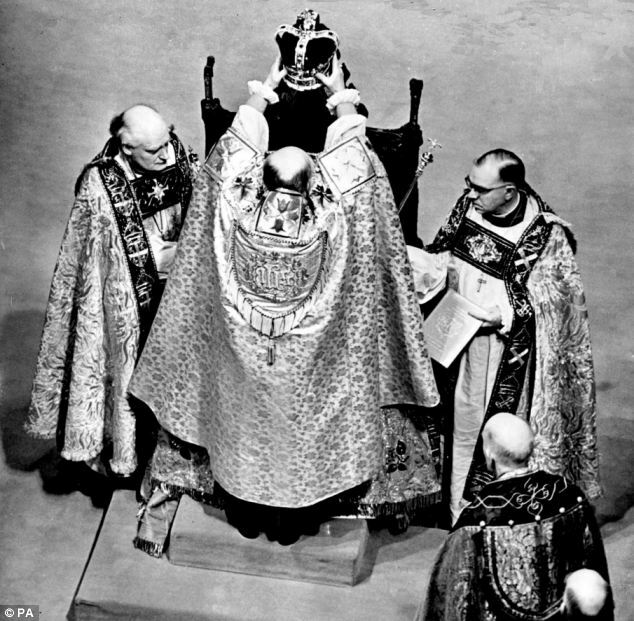 After Communion the Queen will kneel before the Coronation Chair with the Duke of Edinburgh at her side, the Duke’s coronet will also be removed. The Archbishop will say several prayers and ends with a blessing for the royal couple. The Queen will go into the private chapel for a few minutes and as she returns she is now wearing the Imperial Crown. The Sceptre with the Cross is placed into her right hand and the Orb into her left hand. Then, the Queen will leave the Abbey as the congregation sings the National Anthem. The members of the Royal family, clergy and guests will slowly follow. Upon exiting the Abbey the Queen and Duke take their seats in the Gold State Coach and escorted by thousands of military personnel from around the Commonwealth they make their way back to Buckingham Palace through the streets of London. Over her gown, the Queen wore the Robe of State when she entered the Abbey for the coronation ceremony. Attached to the shoulders of the dress, the purple hand woven silk velvet robe was lined in ermine and had a train that was six yards long. The robe was beautifully embroidered with gold thread that featured a design of wheat and olive branches to represent peace and prosperity and the train ends with the Queen’s crowned cypher. The Queen also wore the diamond Coronation Necklace and Earrings that were originally made in 1858 for the coronation of Queen Victoria. The Coronation necklace was also worn at the coronations of Queen Alexandra in 1901, Queen Mary in 1911 and Queen Elizabeth, the Queen Mother in 1937. 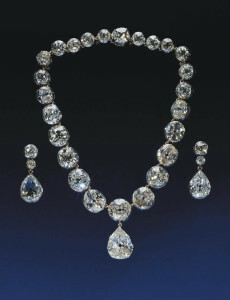 At the time of the coronation in 1953 the necklace had 25 graduated cushion-cut diamonds set in silver with gold links and a large 22 carat diamond pendant known as the Lahore Diamond. The matching Coronation Earrings were also made in 1858 and consist of four cushion-cut diamonds and two drop diamond pendants that are approximately 12 and 7 carats each. 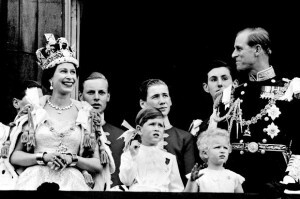 Prior to the start of the coronation ceremony on the journey from Buckingham Palace to Westminster Abbey, the Queen wore the Diamond Diadem. The George IV State Diadem was made in 1820 for the coronation of King George IV. The diadem includes 1333 diamonds, including a four-carat yellow diamond, and 169 pearls with a design that alternates between crosses and a floral design which incorporate roses, thistles and shamrocks which are the symbols of England, Scotland and Ireland. The diadem was later worn by Queen Adelaide, the consort of King William IV. Queen Victoria inherited it in 1837 and she wore it at her coronation during the recessional from Westminster Abbey. Upon her death in 1901 the diadem was passed to a secession of Queen consorts; Queen Alexandra, Queen Mary and Queen Elizabeth. The diamen is now part of the Queen’s Personal Jewel Collection and is easily recognizable as it is worn by the current Queen on the postage stamps, coins and currency of England; it is also worn in the annual procession from Buckingham Palace to the State Opening Parliament.